The Conservative Party has been accused of deliberately sabotaging pre-election TV debates under the guise of a protest against Ofcom’s refusal to recognize the Green Party as a significant enough player to participate. The debates were scheduled to take place in the run-up to May’s General Election. Prime Minister David Cameron announced on Thursday he was “unlikely” to take part after a provisional ruling by media regulator Ofcom said the Greens were not a “major party” and would therefore not be included. Cameron claimed it was unfair to give the UK Independence Party (UKIP) a voice in the debates without including the Greens. The Telegraph, however, reported talks between the parties due to take part in the debates had broken down, with the Conservatives attempting to introduce difficult measures. The only parties present in the discussions were Labour, the Conservatives, the Liberal Democrats and UKIP. The newspaper reported the discussions had broken down and representatives from the parties had already privately agreed the debates were unlikely to go ahead. Labour, LibDem and UKIP representatives had apparently all agreed to the Ofcom proposal that the debates should take place in March and April, but the Conservatives asked for them to be moved back to January. The Tories were also reported to have objected to the proposed formatting of the debates. 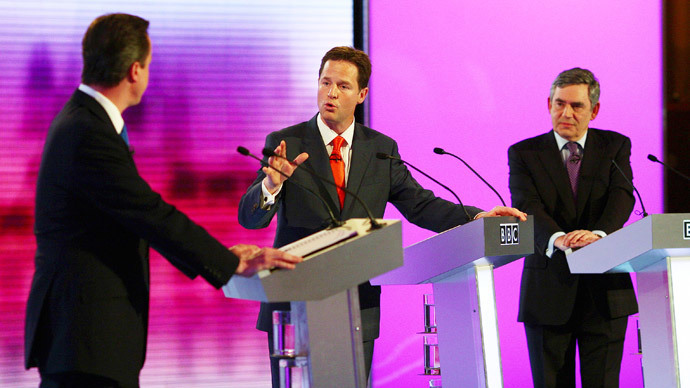 Ofcom proposed the season of televised exchanges would begin with a debate featuring all four party leaders, followed by one with Clegg, Cameron and Miliband, culminating in a head-to-head between the Conservatives and Labour alone. The Conservatives even requested the Northern Irish Democratic Unionist Party (DUP) be included. A Labour source told the newspaper the party themselves had not requested to take part. “Even the DUP hasn’t seriously suggested that they be allowed to take part in the debates. “They’re not standing in most of the UK, so why would they be featured on the main broadcast?” they added. One source suggested the Conservatives were stalling, because the debates could lose them much needed support. The Labour party has said it wants the debates to continue whether or not the prime minister takes part.